To close out 2016, we’re crossing off some final items on our to-do list. Let’s get right into it. 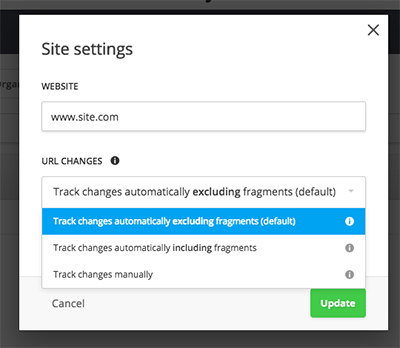 We’ve tested Support for Single-page Applications (SPAs) on several sites and it’s now complete. Starting January 2nd we’ll be releasing Beta access to SPA Support for anyone interested. If you want access to the SPA Beta, all you have to do is reply to this email and let us know. We’ll give your site access on January 2nd. It’s that easy. SPAs are (typically) web apps that load a single HTML page which dynamically updates as users interact with it. In 2016, support for SPA sites and web apps was among the highest requested items (mentioned over 750 times in conversations) with our users. With this change, Hotjar will support almost any type of SPA website in all Hotjar features with the exception of Forms. Full documentation of Hotjar Support for SPA will accompany the Beta release in January. 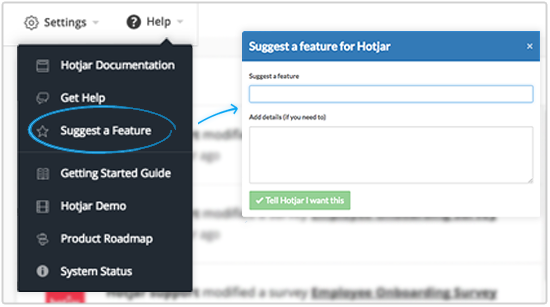 You can now Suggest a Feature item from the Help menu in your Hotjar dashboard. So, how do we prioritize your requests? Our team gives greater consideration to items based on how commonly the Hotjar community requests them. So be sure to upvote other features that are important to you. This system will also keep you updated when progress is made on suggested features from the community. Wondering what we’re working on next? As always, you’ve got full access to see what we’re currently working on by visiting the Hotjar product roadmap. It’s been an incredible year. Last week we collected data from over 153,000 sites and just last month we eclipsed the 10,000 customer mark. We can’t thank you enough for growing with us.